A work by artist De Villeneuve, this tapestry "From The Garden" shows a vase of garden flowers in a still life setting. Known for his pieces which renders flowers and still lifes so beautifully and vibrantly, De Villeneuve is a master when it comes to still lifes. His love of flowers infused with a sense of romanticism and idealism, creates works which portray flowers in a way which makes them really come to life. Here we see garden daisies, tulips and daffodils in a variety of whites and yellows spring into the scene in a composition that is balanced in its composition as well as use of color. The play of light on the flowers is echoed by the creation of shadows on the wall behind. This ability to portray beauty and romanticism and a hint of fantasy is a hallmark of the works of De Villeneuve. 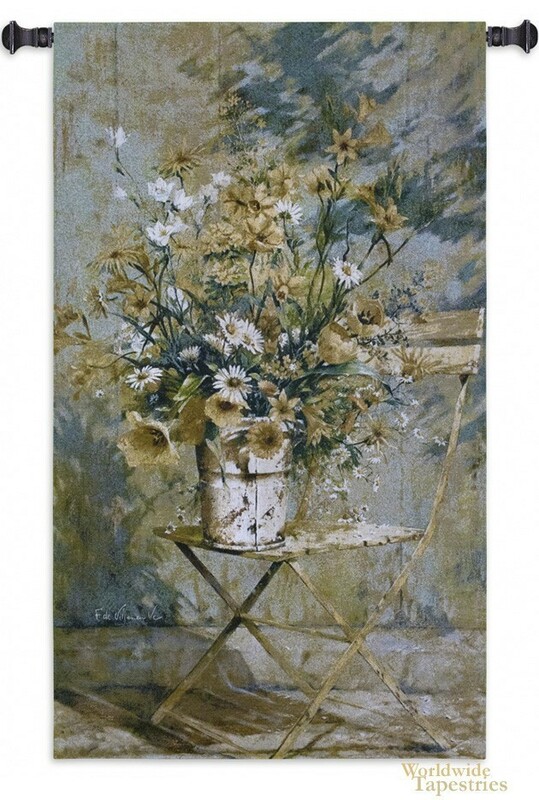 This floral tapestry "From The Garden" is backed with a lining and has a tunnel for easy hanging. Note: tapestry rod and tassels, where pictured, are purchased separately. Dimensions: W 32" x H 53"